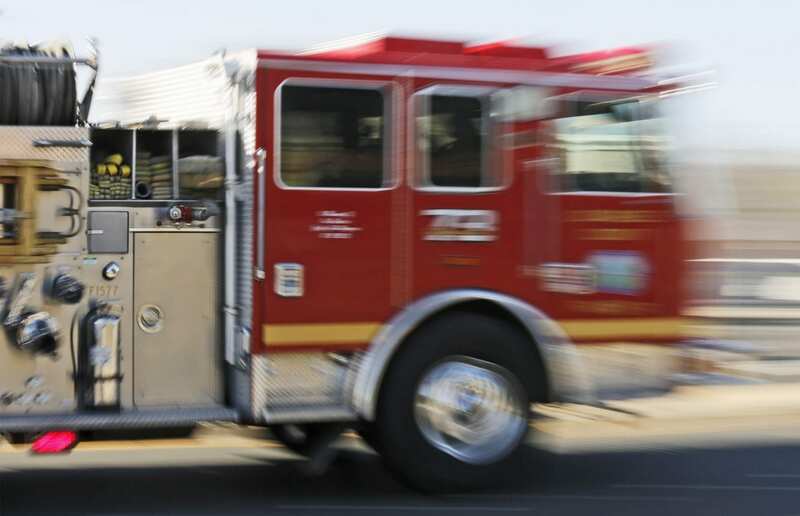 A Los Angeles County Fire Department truck moves quickly to the scene. Photo: Katharine Lotze/The Signal. A motorcyclist hurt and taken to the hospital Monday morning narrowly missed being run over by a big rig, one of the rescuing paramedics said. The injured man, whose identity was not disclosed, suffered minor injuries after the motorcycle and a car collided in the southbound lanes of Highway 14, just north of Golden Valley Road, shortly after 5:45 a.m.
“He was super lucky,” said paramedic Kevin Stickles with Fire Station 107 of the Los Angeles County Fire Department. “When he was hit, the bike slid across the lanes to the shoulder and he went with it,” he said.